Since the publication in 2006 of Livestock’s Long Shadow by the Food and Agriculture Organization of the United Nations (FAO), the International Livestock Research Institute (ILRI) has been acutely aware of the global concern around the environmental footprint of livestock production systems, especially in the context of the rapidly growing demand for meat and milk. These environmental “bads” include greenhouse gas (GHG) emissions from ruminant digestion, nutrient leaching and emissions from manure, and land use change and degradation. However livestock also provide some important environmental “goods”, such as biodiversity, and are a critical livelihood asset to help buffer against climatic and economic shocks. We live in an era of rapid environmental change, much of it anthropogenic in nature, which will have profound impacts on livestock production. Key among these is climate change, which will bring increased temperatures and more variable precipitation, leading to changes in vegetation, pests and diseases among others. Coupled with this are social and economic changes, which alter land tenure, access to and availability of resources, and markets. The risks livestock producers have to manage are therefore constantly changing, requiring them to be highly adaptive. c) Mitigate the impact of current and future environmental change on livestock production systems. The outcome we hope for is the uptake of strategies for the sustainable intensification of livestock production by farmers, policy and other decision makers, across the varied contexts in which ILRI works. We recognize that these strategies must be viable in the face of future changes and that trade-offs amongst development objectives are inevitable, but we maintain that these trade-offs can be more strategically resolved with the input of scientific evidence. 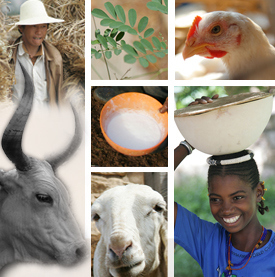 LSE’s research takes an integrated systems approach to analysing the interactions among livestock systems and the environment at a range of scales, from global to local. A cornerstone of the program’s research is combining quantitative and modelling approaches with qualitative approaches, spanning the biophysical and social sciences. The LSE program currently has 45 staff members, including 21 internationally recruited scientists. LSE also hosts CCAFS East Africa Regional Programme, and Theme 4.2 (Data and Tools). See the CCAFS website for more information.